Fourth Row Center: Film Writings by Jason Bailey: On DVD: "The Wolfman"
Joe Johnston’s new take on The Wolfman wants to be Coppola’s Dracula so bad, it can taste it. 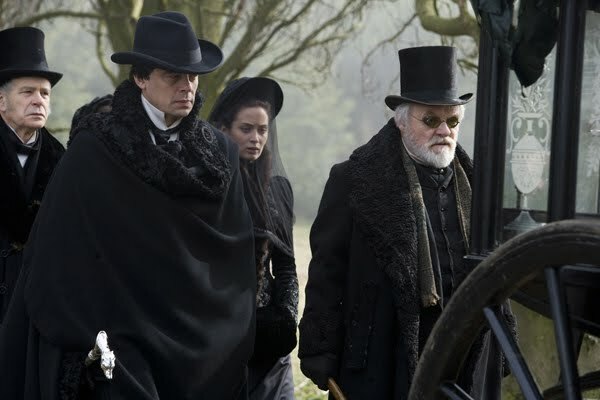 It’s a modern, CG-tempered take on a classic Universal horror tale; it’s impeccably designed in true Gothic fashion, yet splattered with blood and gore a-plenty; and it stars an actor’s actor (Oldman there, Benicio del Toro here), a lovely young up-and-comer (Ryder there, Emily Blunt here), and Anthony Hopkins. There’s not a Keanu in sight, but that’s about the only advantage this picture holds over its predecessor. In execution, it’s more like Tim Burton’s Sleepy Hollow (also penned by this film’s co-writer, Andrew Kevin Walker)—it’s got the look down pat, but there’s not much happening script-wise. From its opening sequences, something seems off—the timing is wrong, and it feels like large chunks of the scenes are missing, replaced by bad dialogue buttons. Example? Del Toro: “I didn’t know you hunt monsters.” Other guy: “Sometimes monsters hunt you.” (Yeah? And?) I’m as much an Emily Blunt fan as the next guy, but she and Del Toro can’t do a thing with their tepid romance (it actually includes a scene where he teaches her how to skip rocks; that kind of nonsense went out in roughly 1948). And for all the impressiveness of Rick Baker’s make-up effects—and seriously, he’s the go-to guy for them—they mesh uneasily with the weightless, cartoony CGI of the monster in motion. There’s things that work. The asylum sequence is wonderfully delirious (it’s like we’ve suddenly switched over to a batshit crazy, but infinitely more entertaining, picture), as is the topper scene with the roomful of doctors. This may be another Hopkins paycheck role, but it’s fun to watch him hiss his campy lines at Del Toro (“You’ve done terrrrrrible thingssssss,” he snarls at one point). And there are some arresting visuals, particularly an overhead shot of blood-stained fingers plinking the ivory keys of a piano. But the whole thing is turgid (it feels way longer than its 102 minutes), and ultimately forgettable; it’s out of your brain by the time you hit fresh air. "The Wolfman" hits DVD and Blu-ray on Tuesday, June 1st. This is based on the theatrical version, right? Evidently the video version that comes out tomorrow is 20-25 minutes longer... and solves *some* of those issues. I liked it well enough to find out. It is, yeah. I didn't get my hands on the screener for the new version. Thanks for the heads-up, though... I may have to check it out.